Supercalifragilis-delicious. That’s what I’m calling this one. I came across this concept from Iowa Girl Eats and knew we had to try it…and it was a big hit! Preheat the oven to 400. Add about 1/4 inch of water to a 9×13 inch glass baking dish. 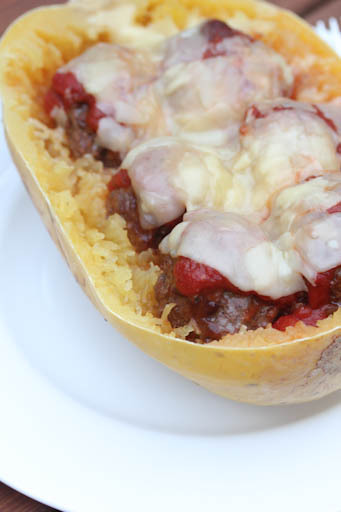 Cut the spaghetti squash lengthwise and place flesh side down in the baking dish. Cover with foil and put in the preheated oven for 60 minutes. Once cooked, remove carefully, flip them over, remove the seeds and loosen the ‘spaghetti strands’ inside the squash. Prepare the meatballs if needed. These baked meatballs are perfect with this recipe. Bake them alongside the squash in the oven, if need be. To each squash half, nestle 4 to 6 meatballs inside and then add about 1 cup of spaghetti sauce over the meatballs. Sprinkle with the shredded cheese. Repeat for the other half of the squash. Return to the oven for about 10 to 15 minutes, or until the cheese has melted.